The Ducks continue to fight for their NCAA Tournament dreams. The Oregon men’s basketball team has had its ups and downs this season. But the Ducks’ stock overall is on the rise. Following a blow out loss to Arizona, Oregon responded with a tough victory over Arizona State, an overtime thriller that demonstrated their ability to overcome adversity and win in a tough environment. All season, the consistent scoring abilities of senior Joseph Young and junior Elgin Cook have anchored this basketball squad, especially in games on the road. “The two experienced guys scored for us tonight. 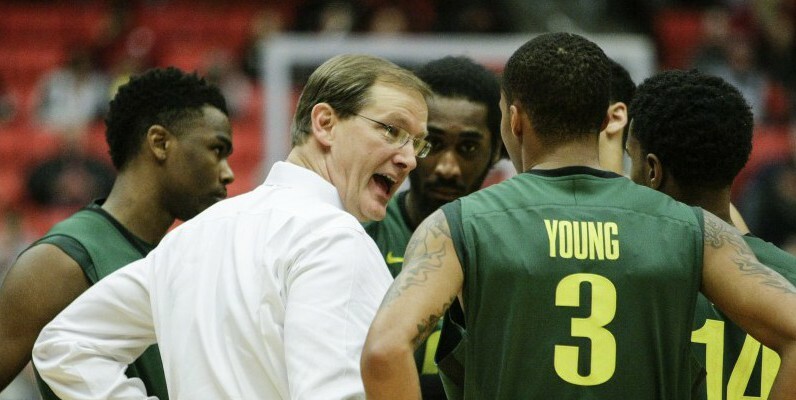 That’s what you have to have on the road,” Oregon head coach Dana Altman said after the ASU game. And for Duck fans there have also been moments of sheer brilliance from its younger players with remarkable contributions from freshmen Jordan Bell, Dillon Brooks, and Ahmaad Rorie. This team has the talent and ability to do great things. But there have been downright frustrating performances and low points as well. It seems the most difficult part of developing a young team has been getting more consistency from its younger players on a weekly basis. Still, the Ducks continue to fight. Oregon is 15-7 overall (5-4 Pac-12) and is fourth in the Pac-12 behind Arizona, Utah and Stanford. The Ducks are remarkably 14-0 when holding opponents below 70 points. “It would have been really easy to fold after a bad loss the other night. We haven’t been beaten like that in a long time,” Altman said. And for Altman, the Duck victory over ASU marks his 19th straight season with at least 15 victories as a head coach at Oregon and Creighton. There is still a lot to look forward to this season, and despite some disappointing performances the Ducks are still in a position to get to the NCAA Tournament. One of the biggest factors in achieving their NCAA dreams is their ability to put bad games behind them, learn from their mistakes and keep playing disciplined basketball. These Ducks continue to believe they can succeed and fans should too. The Ducks hope to bring some desert magic back to Eugene as face the Washington Huskies this Wednesday at Matt Knight Arena.